A GAL NEEDS...: Tropical Traditions Coconut Water Vinegar Giveaway! 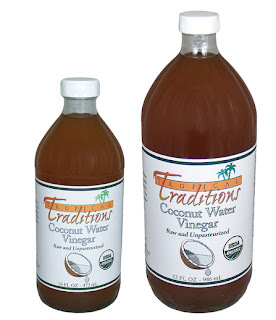 Tropical Traditions Coconut Water Vinegar Giveaway! I decided to try Tropical Traditions Coconut Water Vinegar when I read an article about coconut water being so good for you! Would you like to read the article? It's really short, so shouldn't take too much time. I'm not saying, nor is Tropical Traditions, how much truth there is to it, if any, but you can decide for yourself! I realize that this is not coconut water, but vinegar. And actually, because of the way Tropical Traditions has made sure to retain all of the nutrients in the incubation process, the nutrients found in the raw coconut water are actually enhanced! Tropical Traditions Organic Coconut Water Vinegar is truly unique and is the first of its kind in the US market! Most vinegars are clear because they are distilled and originally made from white sugar. Our Organic Coconut Water Vinegar is not distilled, but raw. It contains the mother of vinegar. In the Philippines most all commercial vinegars are distilled, and the "coconut vinegars" are not made from the nutrient-packed coconut water from inside the coconut, but from the sap of the coconut tree which is used to make lambanog, an alcoholic drink similar to vodka. These "coconut vinegars" are by-products of the lambanog industry. Tropical Traditions is the first company to make a truly organic product from the water of organic coconuts which is raw and fermented with fair-trade organic Muscabado whole cane sugar. This is one of the most nutrient-packed and healthiest vinegars you will find anywhere in the world! Not only is this vinegar obviously wonderful to cook with, it is great to use on the hair to treat oiliness, and a very nutritious addition to drinks. Add 1 - 2 tsps. of coconut water vinegar to water, juice or other drinks. I'm very excited and optimistic about adding this vinegar to the other wonderful products, like their organic pumpkin seeds, that Tropical Traditions has converted me to! Check out the recipes at Tropical Traditions for great ways to use their Coconut Water Vinegar and other great products! Right now the Organic Coconut Water Vinegar at Tropical Traditions is on sale for $7.99 for 16 ounces and $14.50 for 32 ounces! Use the first time buyer code 5954910 for your free Coconut Oil Book with over 85 yummy recipes at your disposal! MANDATORY: Visit the Tropical Traditions Recipe Blog and tell me a great recipe that you'd like to try!! This will qualify you for the drawing at the end of the giveaway as long as I have a way to contact you! Optional Extra Entries: Leave 1 comment for every extra entry indicated below! +2 Follow along on Google Friend Connect! +2 Subscribe to Tropical Traditions e-mail updates! +1 Tweet this giveaway! (2x/day) Leave me the tweet status! "A GAL NEEDS...Tropical Traditions Coconut Water Giveaway! (1/17) http://t.co/gmqdqf9 "
+1 Follow Tropical Traditions on Twitter! +3 Stumble, Facebook, Blog or list this on a Giveaway linky. Leave the link to where you did! This giveaway will end on January 17, 2011 at 11:59 pm. This is open to both US and Canada and entrants must be 21 years of age or older! Special thanks to Tropical Traditions for providing me with a sample to review! I'd love to try the recipe for Coconut Cream Doughnuts. I'd like to try the coconut citrus fudge recipe. I want to try the Coconut Citrus Fudge, sounds awesome! Follow along on Google Friend Connect! I'd love to try the coconut citrus fudge! I'd love to try the gluten free chocolate krinkles! Thanks! Subscribe to Tropical Traditions e-mail updates! Coconut Peanut Butter and Jelly Cupcakes sound quite intriguing. I would like to try the recipe for Coconut Almond cups. I subscribe to Tropical Traditions email updates. I get the email updates from TT. I'd try the coconut almond cups. yummy. I really want to try the Coconut Almond Cups! I subscribe Tropical Traditions emails. I follow Tropical Traditions on twitter @Aerated.